When I read that Susan from Food Blogga was hosting an event called Beautiful Bones, I was intrigued. Afflicted with osteoporosis, she decided to host a food blogging event to increase awareness in women to the potential risks of the disease and encourage them to begin taking steps to protect their bones. Since May is National Osteoporosis Awareness and Prevention Month, her timing was perfect. According to the National Osteoporosis Foundation, osteoporosis is a disease in which bones become fragile and more likely to break. If not prevented or if left untreated, osteoporosis can progress painlessly until a bone breaks. While women are four times more likely than men to develop the disease, men can suffer from osteoporosis as well. Calcium plays an important role in building stronger, denser bones early in life and keeping bones strong and healthy later in life. Vitamin D also plays an important role in protecting your bones. Your body requires vitamin D in order to absorb calcium. While I've been fortunate that none of the women in my family have osteoporosis, I have seen the debilitating effect it has had on others. In fact, someone very close to me died from complications caused by this disease - my dear voice teacher, Ruth Gordon. I'd like to tell you a little about her story. Ruth was a tiny, little powerhouse of a woman. She couldn't have been more than five feet tall in heels, but that didn't diminish the terror she could inspire in an unprepared student with one withering look! Ruth received her training at Juilliard and Indiana University, one of the finest schools in the country for vocal performance. She had an illustrious career in New York for many years before she and her husband retired to the Sarasota area. She wasn't retired for long, though. When word got out that Ruth was in town, every budding coloratura within two hundred miles was clamoring to study with her. It wasn't long before there was a waiting list just to audition to be a student of hers. Ruth was very discriminating in choosing the students she accepted. But, if you were one of the lucky handful of "Ruth's Girls", you could write your own ticket just about anywhere. About six months after my daughter was born, I worked up the nerve to call her and request an audition. The coach I had been studying with had taken me as far as she could and suggested this. To my great surprise, Ruth already knew who I was! In that first phone call she said to me, "I was wondering when you were going to call." You just about had to peel me up off of the floor after that! Needless to say, my audition was a success and I became one of "Ruth's Girls". I studied with Ruth for five years. Under her tutelage, I blossomed. She was a tough taskmaster, but I learned so much from her! Ruth was always brutally honest and never gave faint praise. I don't think I ever got through one song uninterrupted! She picked apart every single note! But, she was always kind and supportive. As a new mother, there were many times I showed up for a lesson frustrated and exhausted. Those were the days I received a strong, hot cup of tea and a stern pep talk at her kitchen table. Ruth suffered from osteoporosis. During the years I spent with her, I watched her small body become more and more brittle. The slightest bump would cause one of her bones to break. Once, she fractured two vertebrae just from walking down the few stairs outside her kitchen door! She was like a treasured piece of delicate, antique porcelain - beautiful and translucent, and so very fragile. That last year, she was in constant, intolerable pain. Eventually, she became bedridden. This immobility, can often lead to loss of muscle tone throughout the whole body including the heart and lungs, increasing the chance of blood clots and collapse of the lungs, resulting in pneumonia. Sadly, Ruth did contract pneumonia. Because of her body's weakened state, she was unable to fight it and she passed away. I miss Ruth and our time together so much. She was a great lady and it was very hard to stand by and watch her body become so ravaged by osteoporosis. I'll never forget her. Ruth encouraged me to stretch and grow and break through the self-imposed limits that I had set for myself. She believed in me and taught me to believe in myself. That is why I've decided to dedicate this post to Ruth Gordon. Wherever she is, I know that she would be pleased. After my Gateau l'Opera post, many of you asked when I was going to post a clip of me singing. Since most of what I have done has been recitals, concerts and other live performances, there aren't many videos or recordings of me in "action". I do have a few things on Cds and I have attempted to include one below. If it works, it a recording of me singing The Shepherd on the Rock by Franz Schubert. Most of you won't understand the words - it's in German- but it is a pretty piece. It was recorded in a theater, so the quality isn't that good. Please be kind. Remember, you asked for it! To participate in Beautiful Bones, Susan has asked that we post one calcium-rich recipe on our blogs any time between May 1st and May 31st. Our recipe can be for any type of dish as long as it contains at least one calcium-rich food as a main ingredient. She was gracious enough to post a very lengthy list of foods that qualify. I was actually a bit surprised at some of them. There were quite a few foods that I never realized were high in calcium. My original plan was to make one of Mr. SGCC's favorites, Oysters Rockefeller. I thought it would be perfect for this event. Not only does the dish contain calcium-rich milk and cheese, but it also boasts spinach and oysters, which are also very high in calcium, as main ingredients. Calcium-rich pay dirt! When the time came to shop for my ingredients, Mr. SGCC was at a late client meeting and I was counting on him to do the shucking. After an unfortunate incident with an oyster knife several years ago, I'm kind of not allowed to use them anymore. Don't ask. Anyway, I saw that the fish market had beautiful freshly shucked oysters in containers, so I bought some. 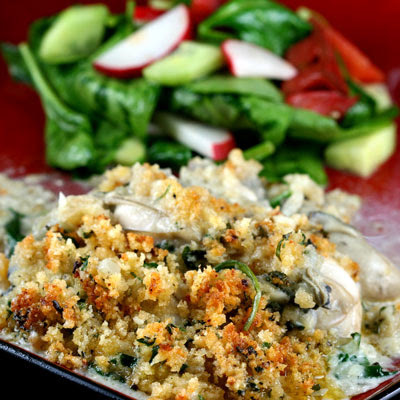 You pretty much need the shells to make Oysters Rockefeller, so I switched gears and decided to adjust the recipe a little and make an Oysters Rockefeller Gratin. Pretty clever, huh? All the same good stuff with no nicked fingers. For a traditional Oysters Rockefeller, garlic, shallots, and spinach are sauteed in butter, infused with Pernod and spooned over oysters on the half shell. 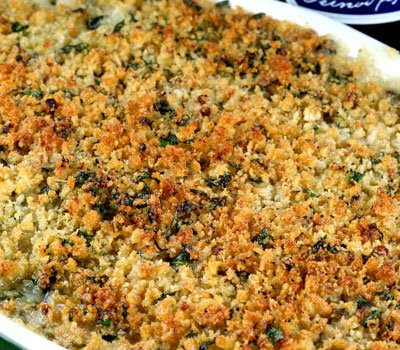 They are then topped with a bread crumb/Parmesan/herb mixture and a creamy, cheesy Mornay sauce. Finally, they are broiled in the oven until browned and bubbly. 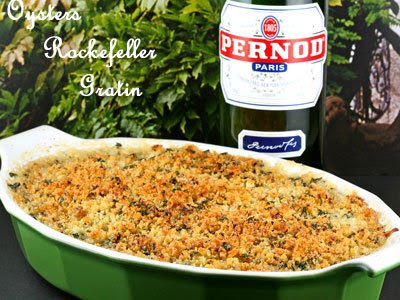 To create my gratin, I prepared the toppings for the dish and the Mornay sauce the same way I would for a traditional Rockefeller. I mixed the sauteed vegetables and the sauce into the oysters, topped them with the bread crumb mixture and baked them. When I took the dish out of the oven, the first thing I thought was that it smelled and looked fabulous. It had a perfect crunchy browned crust and was nice and steamy underneath. I plated it and we sat down and dug in. The flavor profile was spot on. It definitely tasted like Oysters Rockefeller. The oysters were plump and succulent. The dish turned out exactly as it should have, but.....I didn't love it. Mr. SGCC didn't love it either. Mini-SGCC wouldn't go near it. She ate leftover stir-fried eggplant from the night before. I can't put my finger on why we didn't love it, because it wasn't bad. It was really rich with very strong flavors. Maybe it was just too much of a good thing. I don't know - Mr. SGCC did have two servings, but I think it was more out of hunger than avarice. Although, he did make me save the leftovers. I thought about not posting about this dish and making something else. But, I decided that I should post about it, because I think that we can learn just as much from our failures as we do from our successes. I tell my daughter that all the time. I suppose I should practice what I preach. So, here it is, for better or worse, my Oysters Rockefeller Gratin. Prepare Mornay sauce and set aside. Drain oysters into a large bowl, straining and reserving the liquor. Set aside. Melt butter in a skillet. Saute the garlic for a few minutes to infuse the butter. Place the panko in a small bowl and add half of the garlic butter, olive oil, Parmesan, parsley and tarragon. Set aside. Add the shallots and spinach to the remaining garlic butter in the skillet and saute for about 3-4 minutes, until the spinach wilts. Deglaze the pan with the Pernod, scraping up any brown bits. Season with salt and pepper and allow the mixture to cook down for a few minutes. Add to the oysters. Gently mix the Mornay sauce into the oyster mixture. Add a few dashes of the Tabasco sauce. Add more salt and pepper, if needed. Transfer the oyster mixture to a baking dish and sprinkle the panko mixture all over the top. Dot with small bits of plain butter. Bake for about 20 minutes, until the top is browned and the oyster mixture is bubbly. In a small saucepan, melt butter over medium-high heat and whisk in flour. Cook for a minute or two until the flour just starts to color. Slowly whisk in milk and continue cooking, stirring constantly, until it comes to a boil. Reduce heat and simmer and continue cooking 2-3 minutes, until sauce thickens. Stir in the cheese and blend well. Even though you didn't love it, your gratin sounds delicious, very creative. And, Oh, my gosh, you have an incredible voice. I'm not just saying that, I loved the piece you posted. Very, very beautiful. The gratin looks like heaven, and congrats for topping the FFF list, your site is divine, you definitely earned the feature! Great work! And my goodness, the singing is amazing. I lack any and all musical talent in the most absurd way. Thanks for sharing with us your wonderful talent, Susan. You are certainly very skilled and worthy of your reputation! I'm sure Ruth was very proud. I've never had oysters rockefeller before, so I wouldn't know a good from a bad one (egads, and this is a fishing country I live in!). What lovely singing, Susan! You've given us a real gift with this clip. The recipe and post are wonderful, too. Oh, Susan, I was touched by the line: "She was like a treasured piece of delicate, antique porcelain - beautiful and translucent, and so very fragile." What a lovely tribute to a lovely woman. Thank you for sharing Ruth with us and for a delicious recipe as well. Brittany- Thank you! I'm so glad you liked the gratin and my blog! Christine- Thanks! You're right. There was too much of the Pernod/shallot mixture. It overpotwered. Next time, I'll make a plainer gratin and use that as a topping with the panko. The Rockefeller was good. I think I overpowered it with the Pernod. Next time I'll use much less! Grace- Many thanks! I'm so glad you liked the recording! Talk about feeling vulnerable! There is nothing I am more sensitive about than my singing. I just wish it was a better recording. Jen- Thank you on all counts! I'm so glad you enjoyed the clip! Susan- I'm glad you enjoyed the post. I think the description fits Ruth - at least how I saw her. Oh wow, this looks so wonderful. I mean it also sounds so satisfying. That looks really good! I am going to have to try oysters! All I can say is WOW! I can't sign if my life depended on it and I so admire people who - and especially those who do it well! Great idea! And I image there's less shell to bite down on with the preshucked variety. That was beautiful. Really, really beautiful. Thank you for sharing that with us. Thanks also for posting the recipe even if you didn't like it. I think it's important to share even the ones we aren't crazy about, who knows it might inspire someone else to create something amazing. Wow, some windpipes you have there Susan. I've watched a couple of operas, in German and in Italian. I love watching it, even if I don't understand the lyrics... It's awesome. I love the opera turned pop singer Andrea Boccelli and sarah brightman. and by the way, this was a touching tribute to your mentor, Ruth. I'm sure she's proud of you. What an incredible tribute to an important woman in your life. I loved the clip in there as well. Incredible voice Susan! i love oysters and i love gratins. this is beautiful! now that you've put two together, i think i love you. I am not a fan of oysters but you sold me till you got to the part that it was just okay. Looks are deceiving as it appears to be scrumptous. I don't have speakers so I missed the singing, but will be back when I get them. I am in awe of anyone that can sing, what a gift. Cathy- Thank you! It really was very tasty. A little too rich, though. Val- Awww! Thank you. I was happy to share Ruth's story. I don't think that many people realize how devastating osteoporosis can be. Kevin- Go for it! Just make sure you get them from a reputable vendor. SGF- Thank you! I'm really happy that you liked it! 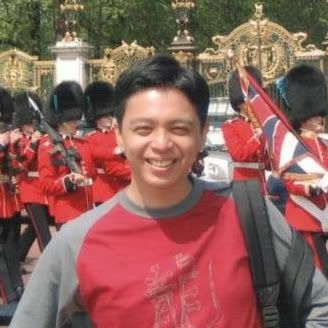 Marc- Thanks! It's definitely much easier without the shells to deal with. Joanne- Thank you so much! It was my pleasure. 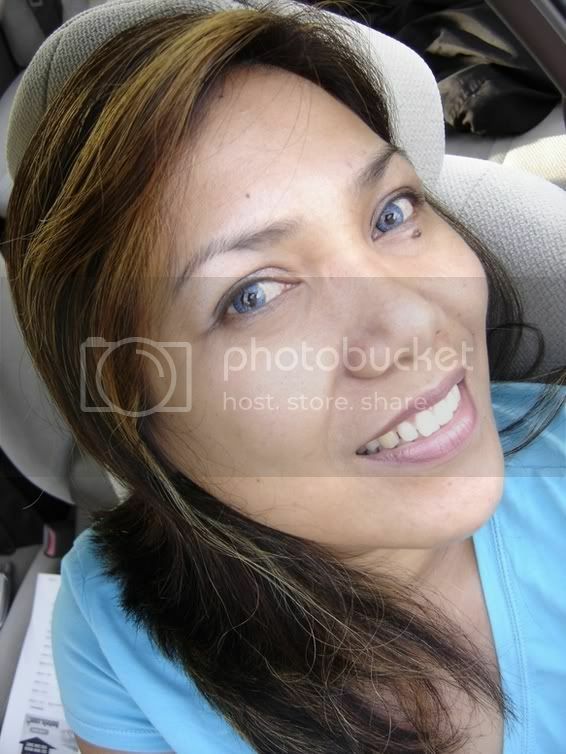 Jescel- Lol! Thanks! I adore Bocelli! I saw him in concert several years ago in Tampa. One of the most exciting concerts I've ever been to! I'm glad you enjoyed Ruth's story. Diva- Lol! I'm really glad you liked it. Maryann- Mille grazie! Sono felice che lo abbiate gradetto. Kim- Yeah. I had to be honest. It was tasty, but not awesome. I think it looked better than it tasted. Susan, Your voice is absolutely beautiful! You can cook, sing and take amazing photo's your like a triple threat!!! :) No wonder Ruth was waiting for your call! I'm a bit late - but, YUM! I love the radish salad, perfect. I love oysters rockefeller - I have not seen a recipe similar to yours. Looks amazing! Jen- Thank you very much! I'm so glad you liked it! Trust me, it's not that soothing when I'm yelling my head off at home! Christie- Not late at all. I'm glad you like it! EAT!- Thanks! I just used my standard recipe and put it together differently. The gratin does look wonderful. Perhaps the traditional way is just more enjoyable - who knows? I think it helps to share the dishes that don't quite hit the mark as someone may come up with an idea on how to change it for the better next time. Thanks for sharing the recipe and the story of your voice teacher. She sounds like she was a wonderful teacher - even if she was tough at times.